Last year Latvia won for the first time in the very short Lativan history in Eurovision (only three participations!). Marie N bewitched the audience in Tallinn as well as the TV-spectators all over Europe with "I wanna". The group F.L.Y. will represent the hosting country in Riga: Latvia. In the Latvian pre-decision they could win with 20.000 votes ahead of the second rank. The attractive trio taped the video-clip in Tallinn (Estonia). Even if the video did not has any coherent story it should show fashion, beauty and sexyness. F.L.Y. are going to release their first album shortly. The title "Hello from Mars" is quite suitable to the main theme of this years Eurovision Song Contest: Planet Latvia. 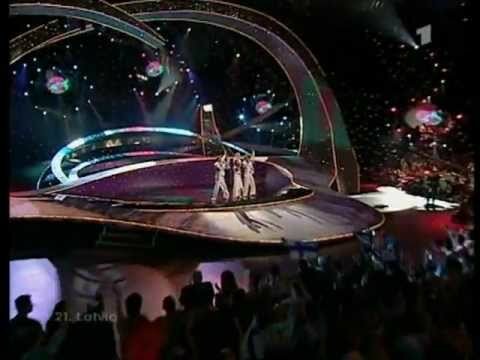 The stage looks like the space ship "Enterprise" with lots of stars and so on. This could be the advantage of playing at home for Latvia. The song is modern and is orientated at the international charts, so that's why Latvia is going to be in a good final position.